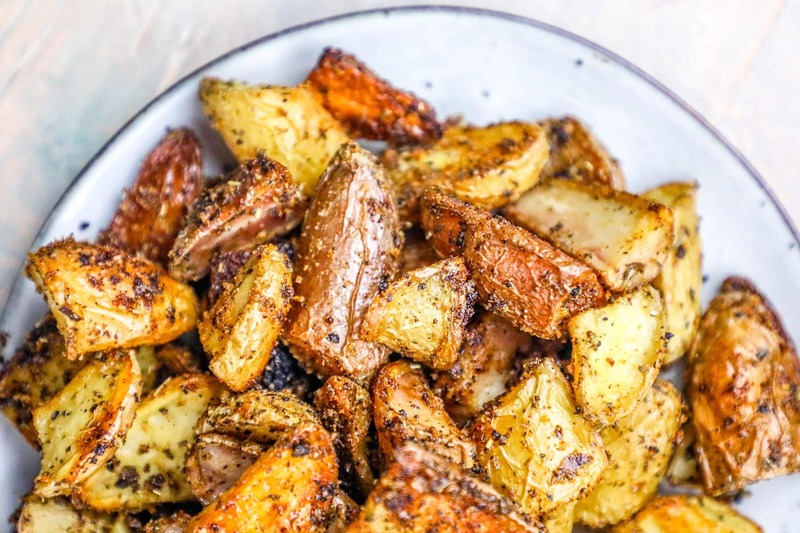 Crispy Herbed Potatoes are easy, delicious, and perfect for a Thanksgiving side dish! Crunchy outside, pillowy soft inside, for the most flavorful potatoes at the party! I am going to go ahead and confess something to you all… I consider myself a pretty good cook, but I have a major downfall. An Achilles heel. I am the WORST at planning delicious side dishes. Or really ANY side dish. I usually start dinner in a nice blissful state, and 15 minutes later kids are screaming, there’s stuff everywhere to be picked up… and whatever plan for a side I had is gone. I’m just lucky to get whatever I started cooking done at all. So today I have one of my favorite side dishes ever for you because it is so incredibly easy. Just cut, toss and bake. No matter how busy your night gets, you won’t mess this one up! 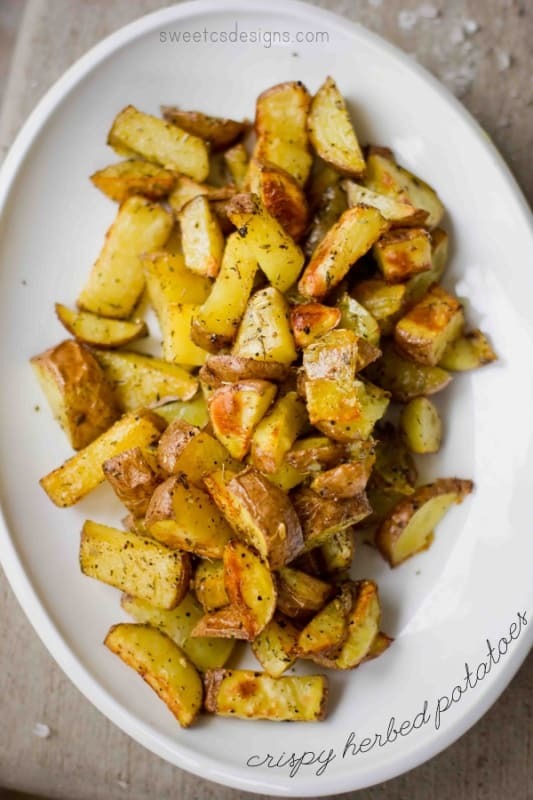 I know a lot of us love to serve potatoes as a side because they are so easy, but it can be tricky to get perfectly crispy, fry-like potatoes when you bake them- unless you have a few tricks up your sleeve. 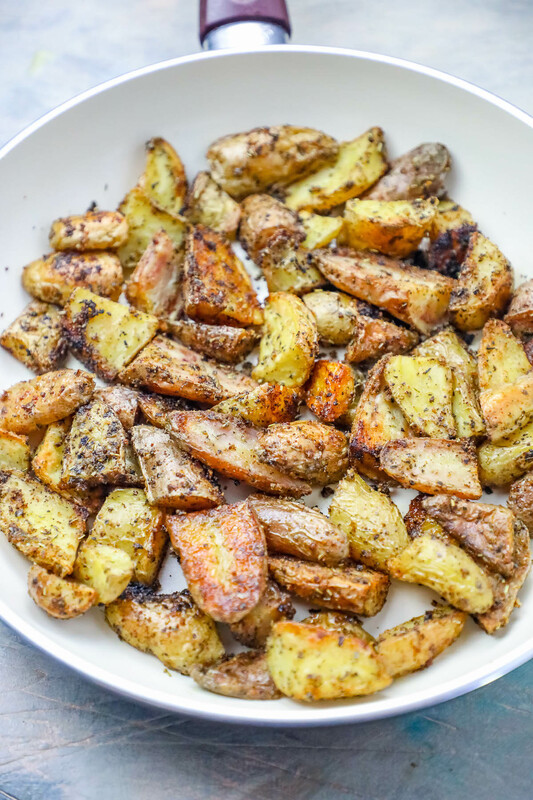 Today I am going to share mine with you to get you the PERFECT no-fuss crispy spuds! 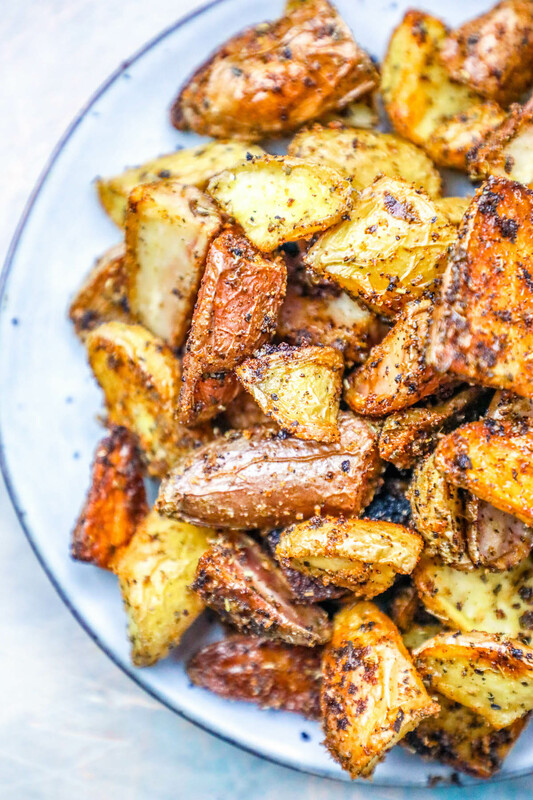 We’re quickly pan-frying these spuds to give them a delightfully delicious crunch, and then baking them to pillowy soft to make a delicious, addictive, and easy side dish perfect for Thanksgiving or a Sunday roast dinner! I’m also including a method I LOVE to get crispy pan-fried results straight from your oven – and how you can save oven space and do part of the work ahead of time, saving you precious holiday dinner space in the oven! This dish is perfect for Thanksgiving – not only because it’s a nice addition/alternative to traditional mashed potatoes, but it can also be partially pre-prepared, leaving the secondary baking step for right before the meal as your turkey rests – which makes it a great addition to not clog up oven space! 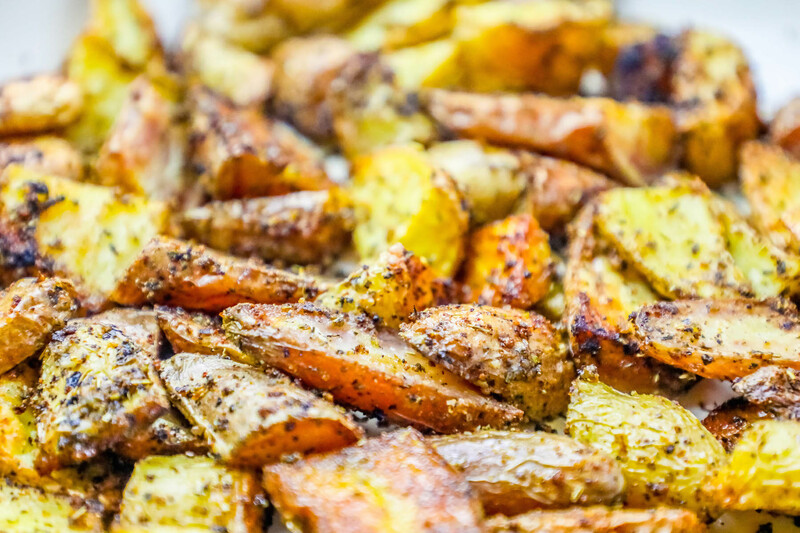 Make sure you don’t overcook your spuds doing this – brown them FAST and remove them from the pan so they are crunchy and butter-browned – but not too cooked – then go ahead and pop them in the fridge or set aside for later – so when you go to bake them, you’ll bake about 5-10 minutes longer. 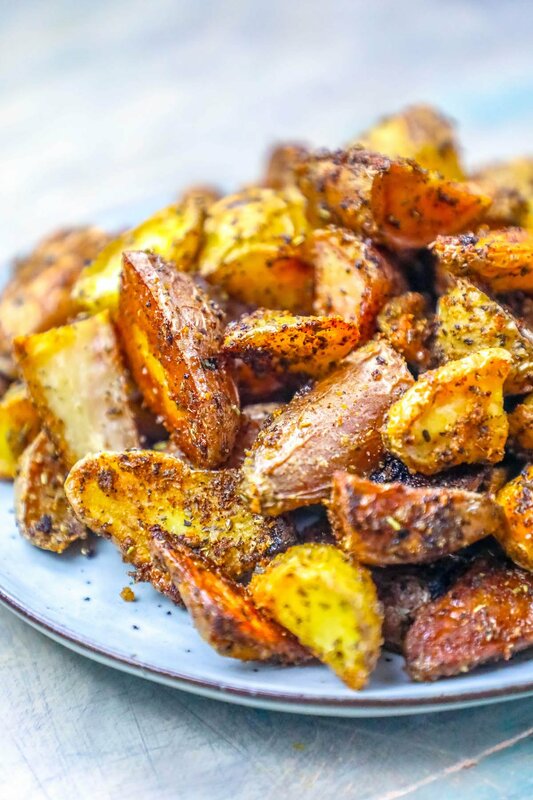 Sometimes, I like to make these potatoes even easier – by entirely skipping the pan-fry process and just oven frying them! 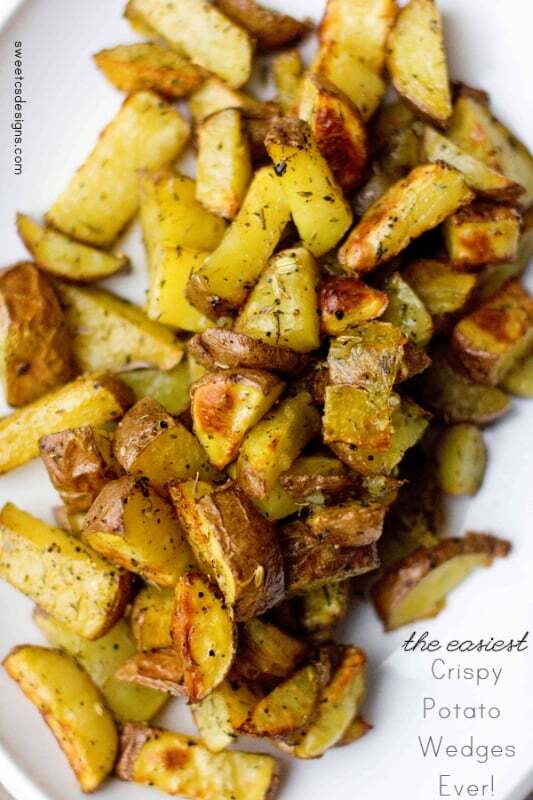 To do this, you’ll swap the butter for 2 tbsp olive oil, and coat the potatoes in olive oil, herbs, salt, and pepper. Let bake at 400 for 35 minutes, and then turn on the broiler to high. Broil potatoes for 5-10 minutes, checking and stirring often to prevent burning and make sure all sides are nice and evenly browned! Wash your potatoes and cut them into small chunks- about 1 1/2". Rub a pat of butter on the bottom of a baking sheet, making sure it coats all over. If you aren't using butter, do the same with coconut oil, or even olive oil- but butter does work the best to keep the potatoes from sticking. Drizzle with olive oil and sprinkle on salt, pepper and herbs. Bake at 400 for 40 minutes, and then set oven to broil. Let potatoes crisp, stir them around a bit, and crisp some more so it is fairly even on all sides. The broiler will be giving you the potato "crisp", so its important not to skip this part- it will make them crunchy and tasty! 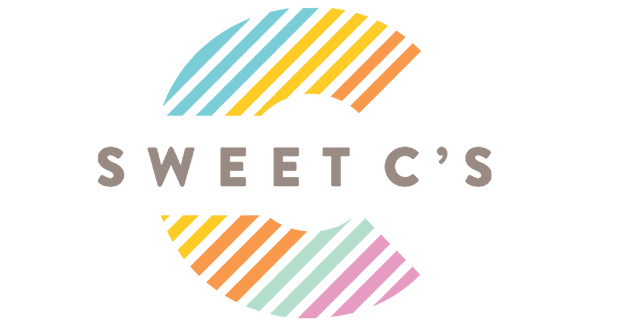 Previous Post: « 20+ of the best Halloween treats! I’ve made these many times, using different seasonings that I have on hand. Try adding sweet Vidalia onions, wedged up to the mix – quite tasty! Yum! These potatoes are making me hungry! Your photography is wonderful and so is your recipe…may try these tonight for dinner!